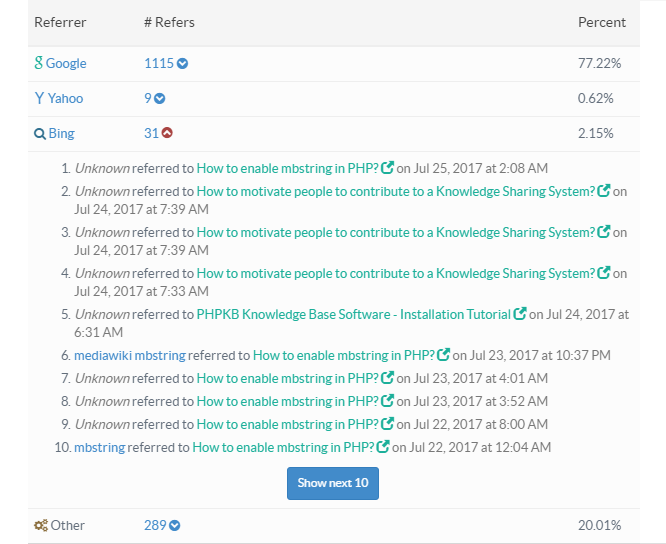 It shows the number of articles referred by each search engine. You can place the mouse pointer on any portion of the donut to view the name of search engine and count of articles referred to it. 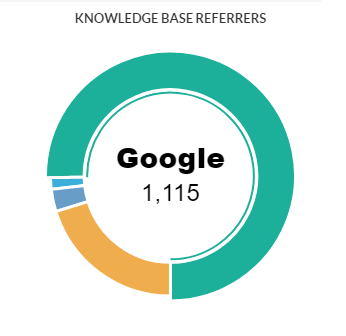 For instance, in the figure above, users found 1,115 articles of your knowledge base through Google. In ML editions, you can select a language from language drop-down available on right side of the page to view referrers statistics of that particular language. 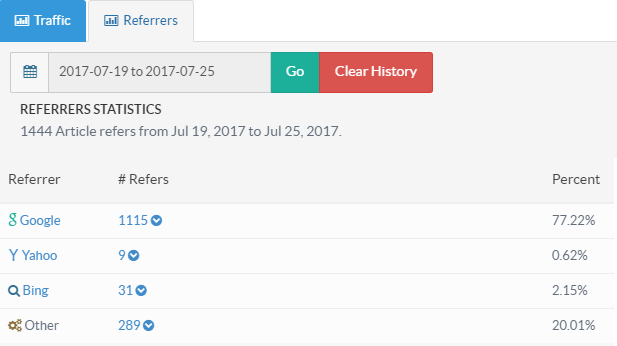 When you click on the date drop-down above Referrers Statistics table, a date range drop-down list is displayed, select the range to view the referrers for that time period only. Referrer: This column displays the name of search engine which sent the traffic to your knowledge base. #Refers: This column displays the number of articles referred by the referrer. Click the count or toggle button to view the list of articles referred by referrer (see the screenshot below). It will display 10 articles at a time, you can click on "Show Next 10" button to view next 10 articles. You can also click on article title to view its details. Percent: This column displays the percentage share of a referrer in relation to the total. Click "Clear History" to remove the data from this database. The data for the selected time period would be permanently deleted from the knowledge base.